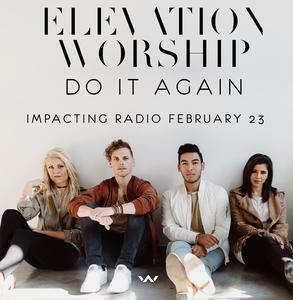 "Do It Again" from Elevation Worship impacts radio on February 23. In 2017, Elevation Worship became the 5th highest selling and streaming act in all of Christian music on the back of significant airplay at radio for the song "O Come To The Altar" which spent 48 weeks on Billboard’s Christian Airplay chart (15 weeks in the TOP 5) and currently remains on Billboard’s AC Monitored chart for the 37th week (26 weeks in the TOP 10). It was one of the most-played songs in all of 2017 at Christian radio. "Do It Again" is the latest from Elevation Worship and it’s poised to repeat the success of "O Come To The Altar" for you at radio. "This song is a testimony of God’s faithfulness. I believe our testimony is one of the most powerful tools we have as followers of Jesus. You know, it’s looking back and remembering how God came through for you, how He provided for you that time when you didn’t know how you were gonna pay that month’s rent, or how He was with you when you walked through the loss of that relationship. This song has been a reminder for me that even when I felt like giving up…felt like quitting…I remember this, that God is FOR ME, and God is WITH ME. The Scripture says in Lamentations 3:22-23 "Because of the Lord’s great love, we are not consumed for His compassions never fail. They are new every morning! Great is Your faithfulness." "Do It Again" is a personal declaration that come what may, my confidence remains in the faithfulness of God and in the promises He has made me." This bundle consists of four (4) versions of this song. Elevation Worship is the worship ministry of Elevation Church, a multisite church based in Charlotte, NC, led by Pastor Steven Furtick. Their most recent album, "There Is A Cloud", was released on March 17, 2017, featuring the song "Do It Again". Their previous album, "Here As in Heaven", featuring the song "O Come To The Altar", was named one of the top Christian music albums of 2017 by iTunes, Worship Leader Magazine, and others. They have toured previously with prominent bands such as Hillsong Worship, Kari Jobe, Jesus Culture, and Lauren Daigle.